Oregon House Rep. Julie Parrish, R-West Linn, has never been shy about her feelings on tolling. "I've been railing about tolls for quite a few years now," Parrish said. "I was not in love with tolling across the CRC (Columbia River Crossing bridge, which was proposed several years ago). ... (And) I was pretty outspoken during the whole (2017) transportation package debate about tolls." From a policy standpoint, Parrish feels there are better ways to fund critical transportation infrastructure improvements across the state. But her passion on the issue — which most recently took form in her co-sponsoring of an initiative petition that would require tolling of existing infrastructure to be approved by voters — stems in large part from what she hears locally. "This is probably one of the most vocal issues that I've heard (about) from voters," said Parrish, who also represents Tualatin. "Because essentially if you want to go to Fred Meyer or a movie theater or have to take your kid to OHSU, unless you're taking back country roads — which are already congested because of Waze apps and traffic diverting apps on phones — you have to go on the freeway." The debate over tolling erupted after the Oregon Legislature passed a transportation package in 2017. The package required the state to submit a tolling proposal to the Federal Highway Administration by the end of 2018, and the Portland Metro Area Value Pricing Committee was formed in November 2017 to evaluate potential tolling scenarios on Interstate 5 and Interstate 205. The idea was that tolling revenue would be used to fund a number of infrastructure projects, including the addition of a third lane on I-205 between Stafford Road and Oregon City. 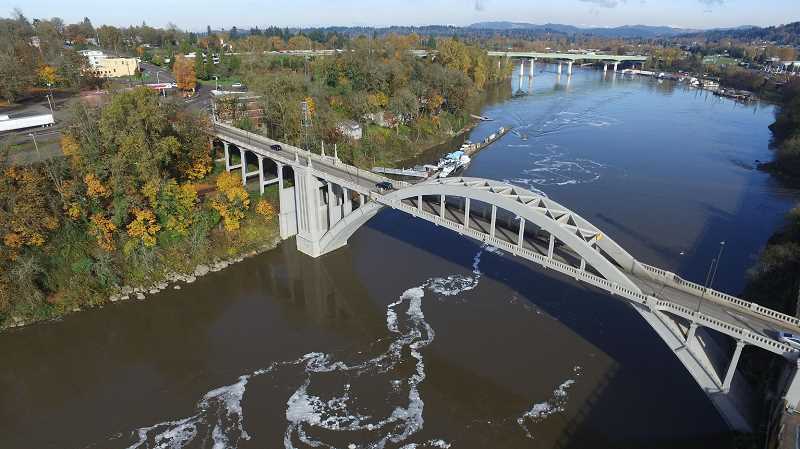 The latest recommendation from the committee called for tolling in that same area, however — specifically on the Abernethy Bridge that crosses the river between West Linn and Oregon City. Parrish's initiative — filed July 27 as the "Tolls Need Voter Approval" initiative and co-sponsored by Gladstone Planning Commissioner Les Poole and state Rep. Mike Nearman, R-Independence, — would, if passed, require voter approval for any tolling unless the funds are specifically used to fund new infrastructure. Should Parrish and her fellow petitioners gather enough signatures, the ballot measure will go to voters in 2020. "We need to go gather 1,000 signatures to qualify for the ballot title, go through the ballot title process and if we can get something understandable to voters, we have until the first week of July 2020 to get the required signatures," Parrish said. The number of signatures required is based on how many people vote in the upcoming gubernatorial election, and Parrish said that will likely equate to about 118,000 signatures. "I think a lot of people are with us, and it's not a partisan issue — it's a checkbook issue," Parrish said. "It's about being able to afford to drive." Indeed, Parrish fears that all-encompassing tolling would effectively price drivers off the freeways. "In areas where you've seen growth in tolling, the existing infrastructure isn't part of the tolling package," she said, noting that doing so requires approval from Federal Highway Administration. "So the freeway system doesn't just become for those who are wealthy enough to use it. It is shared, common, public infrastructure and everybody should have the ability to use it." Rather than tolling, the state should use some of its General Fund for bonding of major transportation projects, Parrish said. "We've seen this growth in the General Fund," she said. "We could pick one big project (per) biennium to commit a bonding payment to." West Linn City Council President Brenda Perry, who serves as the City's liaison to the Joint Policy Advisory Committee on Transportation (JPACT), has been a vocal critic of the tolling evaluation process and felt that West Linn was at times left out of the discussions that took place earlier this year. She's also skeptical about Parrish's initiative petition. "It's probably a waste of time, and I'm not sure if she's going to get anywhere with it," Perry said. "She's coming up for election and it's the first thing she's done on tolling. During public testimony (earlier in the year) she was nowhere to be found, and now she's doing an initiative. I'm not that impressed with it, and I don't think it's going to be effective." Perry believes the petition might not be needed, anyway. "I'm not sure tolling is going to go anywhere," Perry said. "What seemed like a good idea on paper, when it really comes down to it and you get more information, it seems like not a good idea. It would be hugely costly — millions and millions to set it up." And in general, public support for tolling appears to be low. Last December, the Oregon Department of Transportation (ODOT) commissioned a poll that covered Multnomah, Washington, Clackamas and Clark Counties. Only 22.5 percent of residents in those four counties said they would be willing to pay a toll weekly or more often — although, interestingly enough, the largest percentage (26 percent) came from Clackamas County. Willamette area resident Gail Holmes — who until recently served as president of the Willamette Neighborhood Association — is strongly against the idea of tolls on I-205. "I think it's horrible," Holmes said. "And the reason why is, we have no alternate roads to get through West Linn. So I think people will get off the freeway and go through Willamette, so Willamette Falls Drive will become 205 A. And my only solution for that is we triple the toll through Willamette. Everyone laughs at me when I say that, but when push comes to shove, what are we going to do?" Holmes said she's in favor of adding new infrastructure, including the third lane on I-205, and would support Parrish's idea if it was the best option left on the table. "It would be Plan B," she said. "Plan A is, it's insane." Another Willamette resident, Beth Smolens, said she has not paid particularly close attention to the debate and could see both sides. "I grew up on the East Coast, so I grew up with tolls my whole life," Smolens said. "It was a fact of life; it was like paying a tax on certain purchases you make." But Smolens said I-205 presented a special challenge because of the river. "There's places people in West Linn have to shop (at) over across the river ... and there are people who come across the river to shop on this side," Smolens said. "Rivers do create a different barrier." Portland Tribune reporter Jim Redden contributed to this story.